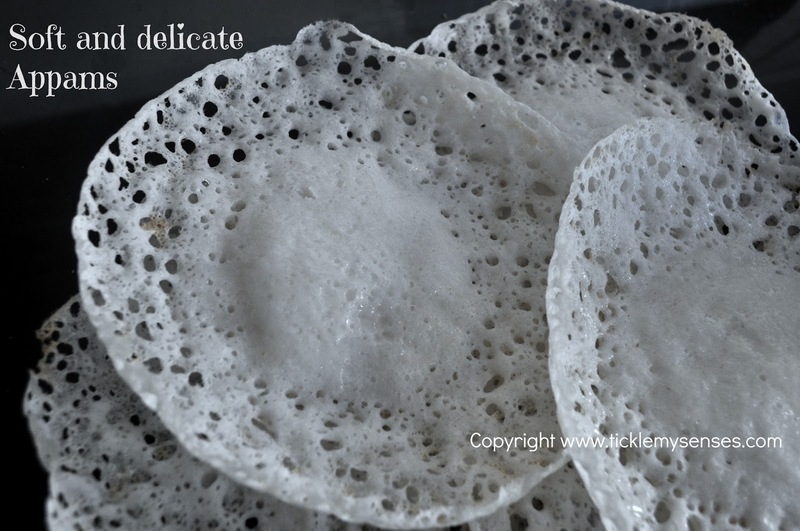 This is a recipe which I developed after trial and error, to make the perfect lacy appams, crisp at the borders and soft and fluffy in the center. 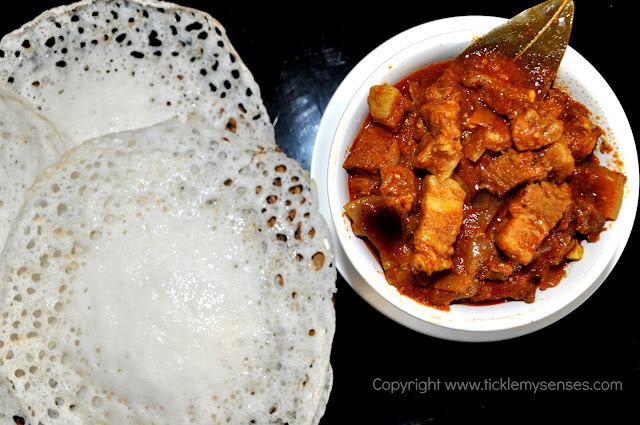 Try it, and im sure you will fall in love with this delectable rice treat from the Southern Indian coast. Wash the rices well till the water runs clear, then soak above ingredients in a large container with sufficient water to completely cover for 5 hours/ overnight. 1. Grind the soaked rices and avalakki in coconut milk to get a smooth fine paste. Add water if needed to allow the batter to be ground finely. 2. Add sufficient water to the batter to get a spoon coating consistency (if a spoon is dipped in the batter, a smooth coating is left on the spoon).The batter should be similiar to pancake batter consistency. 3. Add salt and sugar to taste. 4. In a bottle take 3 tbsps of lukewarm water dissolve 1 tsp sugar, add 3 tsps self activating bread yeast, allow to activate. Add to batter and beat batter well with hand. 5. Leave the batter in a very large steel vessel in a warm place to rise. 6. In summer the batter will rise in 5-6 hours, in winter it takes longer, best to leave overnight. 7. The batter appears bubbly and light and doubles in volume when fermented. 8. Heat an appam pan really well on mediun to high heat. 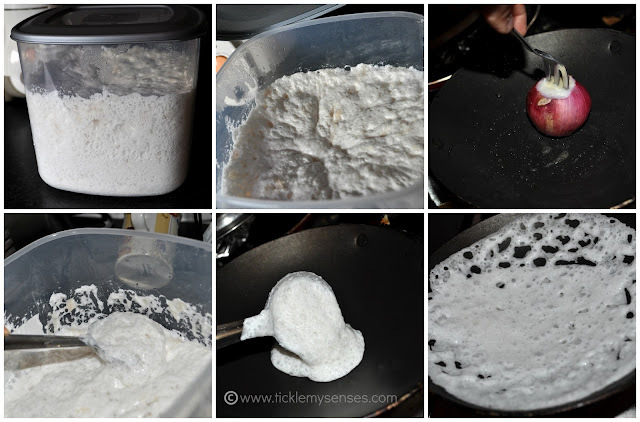 If non-stick no need to grease pan, if cast iron grease pan well using a soft cloth dipped in oil or a small onion. Pour half a ladle full of batter in the pan and turn the pan around to allow batter to coat sides of pan. Place back on fire, close the pan and allow the appam to cook for 2-3 minutes. Then add a few drops of oil to sides of appam, allow it to get crispy. 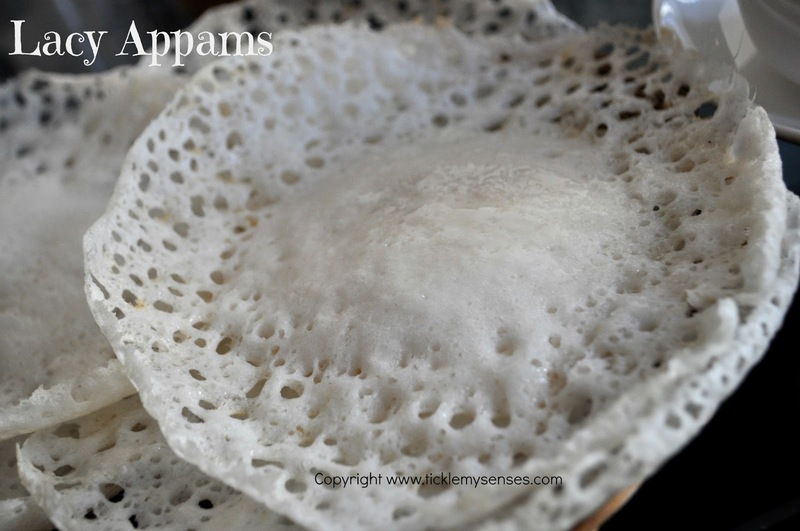 Appams are ready. Serve hot with a vegetable curry, a meat stew, chicken/ mutton coconut curry or pork bafat curry like I have. Enjoy. Note: This post has been updated with new images on 06/08/2013.